A banned driver put lives in danger when he drove his van in the wrong carriageway on a motorway in Leeds as he tried to escape police. Jimmy Price was locked up for 18 months after he drove west in the eastbound carriage on the M62 in heavy traffic. A judge said it was "difficult to imagine a worse piece of driving" after a court heard how he put drivers and pedestrians at risk during an 11-minute pursuit. Price was eventually arrested when he left the motorway, mounted a kerb and the tyres fell off his van. 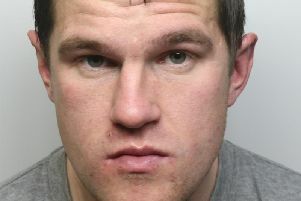 Leeds Crown Court heard Price and two passengers were travelling northbound on the M1 when police signalled for him to pull over. Caroline Abrahams, prosecuting, said Price failed to stop and joined the M62. The 22-year-old left the motorway at Tingley roundabout and tried to force his way through heavy traffic. He then went back onto the motorway in the wrong direction and headed west in the eastbound carriageway. Police abandoned the pursuit but managed to track him from the westbound carriageway. Price drove towards oncoming traffic then left the motorway at the next exit. He drove at 80mph in a 50mph zone on Gelderd Road and then joined Whitehall Road. He went through red lights, drove dangerously through roadworks then on to Walsh Lane where he narrowly avoided hitting a pedestrian. Tyres and other debris began to fall off the vehicle after Price struck a kerb. The defendant was caught after he abandoned the vehicle and tried to run away. He refused to comment when questioned bout the incident, which happened on Sunday March 24 this year. Price, of Leaway, Wigan, pleaded guilty to dangerous driving, driving while disqualified and having no insurance. Richard Dawson, mitigating, said Price was a father-of-two and his family would suffer if he was sent to prison. Mr Lewis described Price's actions as a "moment of madness" when he panicked after seeing police. Judge Simon Batiste told Price he had driven in a "furious and dangerous way." He said: "As a father you ought to reflect on the damage you might have caused to other children." Price was also disqualified from driving for five years, nine months.